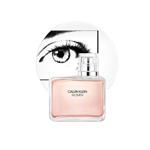 OBSESSED INTENSE CALVIN KLEIN is the deeper exploration of a story of past love and romance. Unbound by traditional female and male fragrance structures, the two perfumes know no rules. Genders are subverted and layered, with the traditional scents of the masculine fougère —particularly white lavender—harnessed for the women’s fragrance, while the men’s scent is in thrall to a dark vanilla.